IT IS shocking that the Chairman of Marmugoa Port Trust (MPT) I Jeyakumar called the activists from all over Goa, who protested against the setting up of additional coal handling terminals by Gautam Adani, “outsiders”. Vasco and the MPT are part of Goa. Goans from any part of Goa have a right to protest against the misdeeds of the MPT. It is not the people of Goa who are outsiders but the MPT and the Chairman of the MPT. The attitude of the MPT is not surprising as like the navy they have been doing dadagiri and harassing Goans ever since liberation. Admittedly MPT has always been a dirty cargo port. This is because the primary cargo handled by MPT has been iron ore dust which is extremely polluting. For over 60 years since liberation the MPT has been a party to choking the lungs of the people of Vasco by permitting trucks overloaded with iron ore to pass through the port town. The bypass road which was to spare residents of Vasco iron ore dust pollution has been delayed by over two decades. 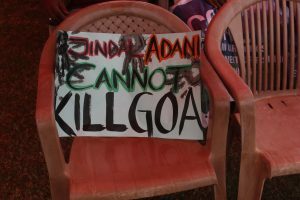 ADANI AGENT: The Mormugoa Port Trust is aiding and abetting the Adanis to increase the coal handling capacity of the port to over 50 million tonnes for the benefit of thermal power plants in Karnataka. WHEN mining was suspended, MPT in its greed decided to promote the import of coal which is much dirtier and more polluting then iron ore in a big way. When ore exports were at the peak of 40 to 50 million tonnes there was little space for importing coal at the MPT. When mining was suspended for four years MPT not only encouraged the import of coal which all other ports in country said ‘no’ to, but permitted the Jindals to set up special terminals for the import of coal. Coal, unlike iron ore, is not handled by a mechanical handling plant and not transported in covered wagons. Moreover the coal that is imported is not meant for consumption in Goa but for the benefit of the Jindal steel and aluminium plants in Karnataka. Already the MPT imports over 10 million tonnes of highly polluting coal every year. The quantity is expected to increase to over 100 million tonnes if the central and the state government give the green signal to the Adani project for setting up additional terminals exclusively for the import of coal. This is because the Adanis have won a huge contract for extracting billions of tonnes of coal from a site in Australia. They have proposed that 100 million tonnes which they have been licensed to extract from Australia could be imported through the MPT in Goa. The Modi government, which is very close to Adani, chose Goa and the MPT because they thought that since Goa was also ruled by BJP there would be no objection. The Union Minister for Shipping and Transport, who has been allegedly bribed by Adani, got his colleague heading the Ministry of Environment, Forest and Climate Change (MoEFCC), to approve the expansion of the coal capacity of MPT without any Environmental Impact Assessment (EIA). Apparently the Ministry of Shipping and MoEFCC told lies to the Goa State Pollution Control Board (GSPCB) and to the people of Goa. The GSPCB also colluded in the violation of rules to grant permission for dredging the port to create the new pollution terminals for coal and to permit bigger ships to come into the port. Fortunately the conspiracy by the MPT with the Adanis was exposed in a PIL filed with the National Green Tribunal (NGT) which confirmed that the environmental clearances have been obtained on the basis of false statements by the Ministry of Coal and the Ministry of Shipping as well as the MoEFCC. At the time clearance was given to the project, the GSPCB did not have a chairperson or a member-secretary. The NGT ordered a fresh public hearing to find out the hidden facts over the pollution time bomb. Even at this stage the MPT tried to block and sabotage the public hearing. It was scheduled to be held in the tiny Vasco residency hall. In the wake protests, the venue was shifted to the Tilak Maidan Football Stadium in Vasco. We are not surprised that BJP chamchas including Chief Minister Manohar Parrikar have been supporting the MPT in making Goa even blacker than it already is. We were led to believe that Goa Forward (GF) believed in Goa, Goem and Goenkarponn. Surely Vijai Sardesai should understand that pollution is not part of Goenkarponn. Surely he is not so illiterate that he does not realise how polluting coal can be. Yes as he has been justifying the country needs coal not only to generate power but even for making steel. But Goa does not have any thermal power plants in which coal is the main raw material. In fact Goa does not have any power plant at all and is dependent on the national power grid. The trend worldwide is towards non-polluting power plants. Power plants which reduce the carbon imprint. Power plants which do not aggravate climate change. Goa has a lot of sun light. It can develop solar power plants. There is lot of wind in Goa particularly in monsoons. Goa can develop wind energy. Even the huge amount of waste that are causing a major problem of hygiene and are leading to vector bone diseases like malaria and dengue can be solved by setting up waste treatment plants which also generate power. For all the criticism against it, the Saligao waste management plant has already started generating power. In sharp contrast to the waste management plant put up by Fomentos. Mining companies only know how to pollute. They do not know how to reduce pollution. IRONICALLY the party of Goenkarponn has been defending the MPT. The spokesman of the party Prashant Naik continues to support the expansion of the coal handling capacity of the MPT. Subject to the condition that there is no pollution while handling coal. This is like saying make an omlette without breaking a egg. Off course precautions can be taken but they are expensive and will cut into the margin of the Adanis. The greedy Adanis and the equally greedy mine owners like Vedanta and Fomento do not care about either the health of the people or if they walking about covered in black coal dust. They live in air conditioned houses. Travel in air conditioner cars and are never exposed to pollution. Despite which, by virtue of being a mine owner, Audhut Timblo, the chairman of Fomento, has a very severe respiratory problem. Ironically, the only MLA who came to the support of the people protesting against the expansion of the coal handling capacity is the Catholic BJP MLA of Vasco, Carlos Almeida. Maybe he had no choice after the parish priest of the St Andrews Church publicly joined the peoples movement. Carlos cannot go against the will of the people as he wants to be re-elected. He is the only BJP MLA who has blasted the MPT and opposed the expansion of the coal handling capacity. The Vasco MLA has also protested against the remarks of the MPT chairmen calling activists from outside Vasco, ‘outsiders’. It is unfortunate that the Congress party which is still divided had remained silent on the MPT-Adani unholy marriage. While all other states want to remain ‘fair and lovely’, Goa is the only state in the country where chief ministers are eager to make the state black and unhealthy. May be the chief ministers could not help it in the case of mining because it provided jobs to lakhs of Goans before Goa became a tourism attraction. But surely no chief minister who has the interest of Goa in mind will permit huge imports of coal through MPT which will make Goa an unhealthy eyesore. GOA is now the most important tourism destination in the country. It is the only state which gets direct charters from the UK and Russia and many other countries. It is the only state which attracts domestic tourists twice the size of Goa’s own population. It is the only state where daaru is available at 50 per cent of the price that prevails in its neighbouring states. It is the only state in the country which welcomes all races, communities and caste. Goa does not beat up Nigerians. Goa does not object to Russians and Israelis despite allegations that they are selling drugs in Goa. Goa does not object to all the bevdas and all the gamblers who flock here. Goa is the only state in the country where people are not told what they can eat or more importantly what they cannot eat. Goa is the one of the few states in the country where beef has not been banned. Goa is the only state in the country where minorities—Muslims and the Catholics—feel safe. Goa is the only state which has never seen a major communal riot. Firangis comes to Goa because they are tired of the ‘fair and lovely’ craze. They want a beautiful brown tan and will wear little or no clothes because they want their tan to be uniform, not because they want to attract the attention of domestic tourists. Domestic tourists on the other hand come to Goa because they want to enjoy the beach and the cheap daaru and look at all the firangi women in their bikinis since the average domestic tourist is obsessed with ‘fair and lovely’. People come to Goa because even with all the vehicles and all the construction the pollution is much less than in Delhi or Mumbai or Bangalore. They come to Goa because even in the capital city there are trees and gardens. They come to Goa because in talukas like Pernem and Canacona and Saguem there are still more green areas then buildings. They come to Goa because it is not a concrete jungle yet, like Bombay or Delhi. They come to Goa because they can breathe the clean air of Goa. A layer of coal dust over Goa will drive away all tourists. 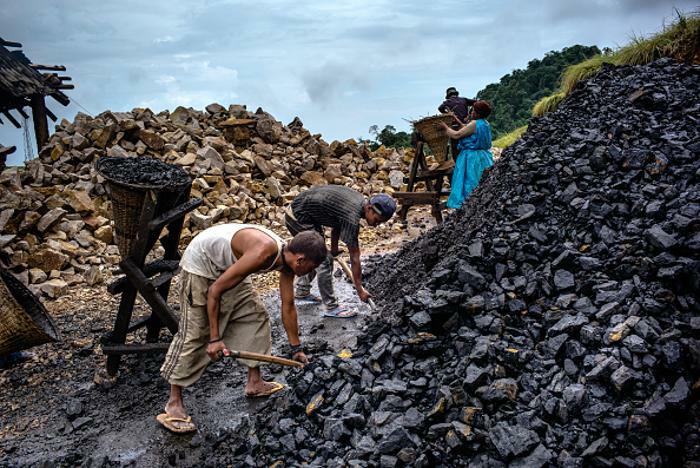 If they can only breathe iron ore dust and coal dust, and stepping into the open will only get them a coating of black coal dust, why would they come to Goa? Even domestic tourists who come for the cheap daaru do not want to go back with a coating of black coal dust and unhealthy lungs after a visit to Goa because of MPT and Adani. This is to be viewed in conjunction with the business plans of MPT and corporate magnates importing and handling coal. It is evident that Goa’s rivers are to be modeled into speedy highways of coal transportation and anything else to be flagged as obstruction, says PRABHAKAR TIMBLE. 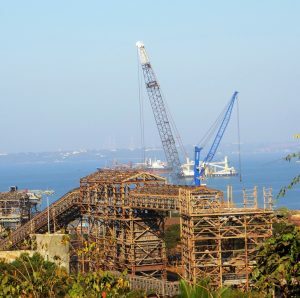 The business plans of the Mormugao Port Trust (MPT) to enter into the foray of coal handling on a gigantic scale necessitating redevelopment of berths 8, 9, and barge berths, at the port for multi-cargo activities which include capital dredging of the channel cannot be viewed as a project restricted to the MPT area with likelihood of adverse repercussions restricted to Vasco. The coal handling by MPT on the envisaged scale will undoubtedly punch the entire state of Goa as it would involve further transportation by road, rail and river routes. Hence, the coal handling operations of the MPT should not be assessed only within the circumference of MPT or Vasco. It’s an all Goa phenomenon and could well turn out to be a catastrophe of bigger dimensions if left without prior scientific scrutiny. The environmental impact assessment study should therefore incorporate these entire extended operations at the port and beyond. The tenor and tone of the MPT invoking the “outsiders” doctrine at the recently concluded public hearing needs condemnation from all quarters including the state government. First of all, the contention is not factual. It would be disastrous to adopt such an approach. It is most shocking that an authority such as a port trust which is almost given the status of a local self-governing institution even thinks and later makes public propositions to that effect. Such narrow and parochial defences are treacherous coming from a public authority which wields economic power and owns quite sizeable land and river resources of Goa. MPT should also realize that the people are dissatisfied with the arrogant and dictatorial manner with which the operations have been conducted in the past and regard the entity as ‘untrustworthy’. THE nationalization of the six rivers of Goa cannot be delinked from this big business plan of MPT. The apprehension that the nationalization is back-door strategy of privatization of putting the rivers and river banks of Goa to the exclusive use of private corporate house for coal transportation gets credence. The assurances of the Chief Minister of Goa that the state government will continue to exercise control is an eyewash as it does not have any recognition in the statute. The Nationalization of Inter-State Rivers Act clearly states that the central government shall have exclusive right and control over all inter-State rivers once it is decided to bring the rivers under the enactment. The faith that both the state and central governments being of the BJP, Goa’s wishes would be respected or the confidence that Goa’s Chief Minister will horn the relationship skills to protect local interests has no legal basis. The final word on the utilization of the rivers and river banks of Goa will be of the Ministry of Surface Transport and Inland Waterways Authority of India. The Inland Waterways Authority of India (IWAI) assumes the control of the rivers and river banks which is described as ‘appurtenant land’ to national waterways. The danger in this, is that this land is not demarcated. The infrastructure development of national waterways includes structures such as docks, wharves, jetties, landing stages, locks, buoys, inland ports, cargo handling equipment, road and rail access and cargo storage spaces. The ‘conservancy’ measures to be taken by the IWAI include dredging, closure, diversion and abandoning of channels. It is significant to note that there is no mention whatsoever of protection of natural flow of rivers or of river life and diversity or of the rights of dependents on river life and river banks. A combined reading of the Nationalization of Inter-state Rivers Act and the Inland Waterways Authority of India Act indicates that these enactments frame the utility of the rivers to shipping and navigation and nothing beyond this. As a result, the authority is granted power to remove or alter any obstruction or impediment in the national waterways and the appurtenant land which may impede safe navigation. My mind cannot fathom how the IWAI will recognise the rights of the fishing community and protect the diverse river wealth or facilitate passenger transportation and river tourism when its only mandate is to consider rivers as the exclusive channel of shipping and navigation. This is to be viewed in conjunction with the business plans of MPT and corporate magnates importing and handling coal. It is evident that Goa’s rivers are to be modelled into speedy highways of coal transportation and anything else to be flagged as obstruction. THERE is no dispute that we need coal for power industry and for further national development. At the same time, Goa should not be made to pay the irreparable price for such development. It makes political sense for any new government to take unpopular and anti-people decisions in the very first year as it gives safe time for damage management. However, succumbing to the coal lobby in the manner proposed would do irretrievable damage to Goa in terms of fish wealth, tourism and control on river resources. The state government should summon a detailed scientific study from the National Institute of Oceanography (NIO) on capital dredging of rivers and a cost-benefit analysis from the Goa University on Goa becoming a coal hub. The MPT business plans on coal handling should be put on hold pending the above studies.